Home - Horse Riding Centre Dublin, riding lessons, livery, horses riding school, stables, pony trekking, equestrian centre, Dublin Mountains, Wicklow, Ireland. "A family run horse riding centre, with lovingly cared-for horses". 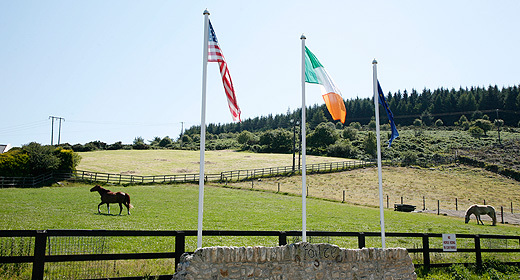 The Paddocks Riding Centre is a truly fabulous equestrian facility located high in the Dublin Mountains and covers an area of approximately 3,000 acres overlooking Dublin City. We are a family run horse riding centre with stables and facilities to house a large number of horses. 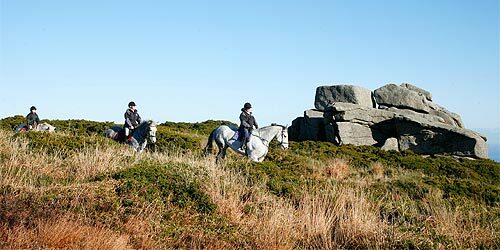 Why not get away from the busy city life and enjoy some riding lessons, a one or two hour exciting trek through the Dublin mountains enjoying the amazing views and beautiful scenery. For a special day out, why not hold your birthday party at The Paddocks (for kids or adults) followed by BBQ or party. Join us for a work event or even a friend's hen party. We are a family run riding centre with lovingly cared-for horses. Today, we have 45 stables with all the facilities and fully qualified staff to match, resulting in a very friendly and organised riding facility. 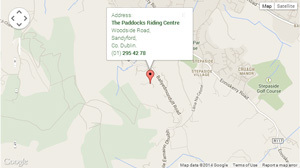 We are located near to the village of Stepaside and only minutes from the M50 motorway. We offer lessons from beginner standards to competition level for both adults and children. We also cater for adults and children who don't own their own horses as we provide transport, tuition and supervision to hunts, showjumping events, pony club, cross-country and organised groups for fun days out into the countryside. We specialise in birthday parties for children and adult, plus beach trekking. "Pure, unbridled thrills ....the stable yard exudes a sense of calm order.... once their lesson is over they return to the yard for lunch before going on their afternoon ride-out – the most exciting part of their day.... by the end of the week they can’t get enough of it."